Quick, what is the purpose of Sunday School? Your answer is likely that Sunday School is intended to teach children about God. Yet, that is not why Sunday School was first started. Sunday School was launched as a community service to teach underprivileged children how to read. Yes, they used the Bible to do so, but I suspect that was as much pragmatic as strategic. By the time public schools took over this task of teaching children how to read—thereby making Sunday School obsolete —it had become an entrenched institution within the church. To ensure its self-preservation Sunday School morphed into something else. It became what it is today: a means to teach kids about faith. Never mind that parents should be doing that. So despite having fulfilled its objective, Sunday School lives on. I had all this in the recesses of my memory when I read Wesley Granberg-Michaelson’s excellent book From Times Square to Timbuktu. As one small part of a much greater theme, he shares about his church that started English as a second language (ESL) classes to serve the area’s immigrants (page 103). That grabbed my attention. Just as teaching reading was once a community service effort provided by the church, so too, churches can now offer ESL classes to serve their local community. While the children of immigrants will learn English in school, both directly or indirectly, who will teach the parents, who lack such opportunities? Though some ESL programs exist, there is still a void. And who better to fill this need then the local church? Who better to serve the community than followers of Jesus? After all, Jesus came not to be served, but to serve (Mark 10:45). We, as his followers, should do the same. Can your church offer ESL classes to serve your local community? 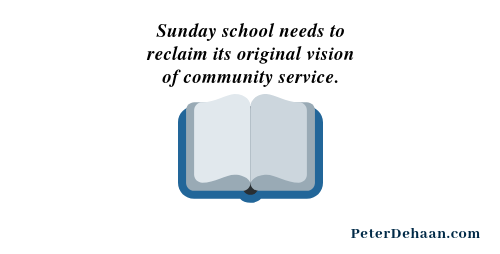 What are other ways Sunday School can reclaim its original purpose? One other great purpose it now serves, you failed to mention. Socialization. Sunday School friends form a group of believing friends, so necessary in this ever more secular world. Susan, this is a good point. Though it may no longer apply, my kindergarten teacher told my mom she could always pick out the students who went to Sunday School: they behaved better, knew how to listen, and followed directions.